Trigard is offering a one-of-a-kind committal ceremony for families who have lost an infant or toddler. The Remembrance Bear Ceremony revolves around a stuffed teddy bear that is gently tucked into Trigard’s Serenity casket vault combination. The casket vault’s cover is personalized with an Appliqué including the loved one’s name, dates and a photograph of the teddy bear. 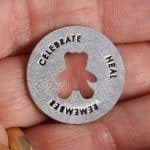 These one-inch, pewter rings have a teddy bear-shaped hole in the center. Around the edge are the words: Remember. Celebrate. Heal. The ring can be placed on a key chain, turned into a necklace or simply kept in a pocket. Keepsake poem cards are also available. “The Remembrance Bear Ceremony provides closure and new memories that are forever etched into a family’s hearts. It is a unique funeral service that you can only get with Trigard,” added Darby. For more information about the Trigard Serenity casket vault combinations or the Remembrance Bear Ceremony, call 800-637-1992.